In a good swing, both tempo and rhythm feel smooth. When talking about their golf swings, people often use the words “tempo” and “rhythm” interchangeably. However, the two are not the same. Tempo refers to the speed of the swing, and rhythm refers to how well all the parts of the swing work together. For this reason, some teachers use words such as “flow” to encompass both aspects. You need both tempo and rhythm to have a consistent and powerful swing. Your physical strength places a practical limit on the tempo of your swing. The faster you swing, the more forces your swing generates. If you are not strong enough to control these forces, you will lose control of the club and mishit shots. You should be able to swing properly at a slower tempo, where the forces are not greater than your ability to control them. This helps you determine the proper speed for your swing. Teacher Bob Toski writes that you want to “surrender to the swing.” Relaxation--letting the club do the work while you gently guide it--is something most teachers try to teach. Think of the times you have been told to grip the club lightly; to take an athletic posture with your knees slightly bent, rather than standing stiffly at address; or to “waggle” the club before swinging. Such “active relaxation” helps you stop working against the movements in the swing; rather, you allow them to happen. 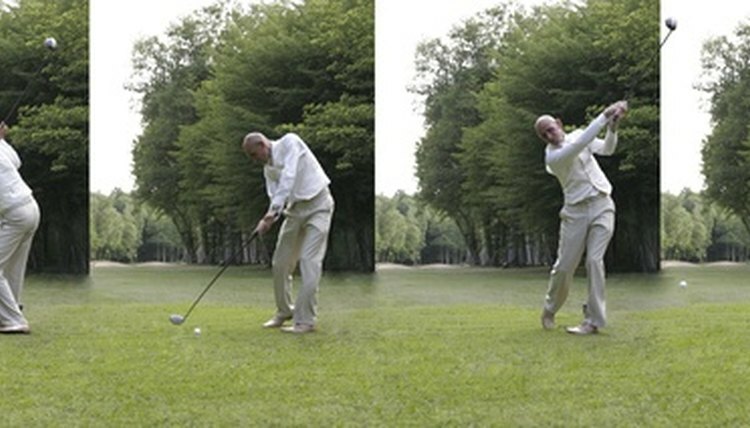 Good rhythm generally maximizes your swing’s tempo, and good tempo smooths out your swing’s rhythm. David Leadbetter advises his students to avoid standing still over the ball; he prefers that they begin a gentle motion before swinging. One of his drills involves holding the club a foot ahead of the ball, then swinging it back without hitting the ball to start the backswing and ensure that the movements in the swing blend together more smoothly. Novosel found that, while some players had slower tempo swings than others, almost all had a backswing three times longer than their downswing. This finding helped show how rhythm and tempo were related. If you can both retain your balance during your swing and hit the ball accurately, you are not swinging too fast and all the parts of your swing are working together properly.